We've been here about two-and-a-half years now, and we're beginning to see authors come back around for second and third visits with their new books. Add to this growing list of repeat visitors Elizabeth Hartley Winthrop, who, at the advice of Brad Watson, her writing mentor at Harvard, came to see us in May 2006 when she was touring for her debut novel, Fireworks. We were impressed by the strength and maturity of that book, so we tried to rally a crowd. A cocktail party on the Alluvian's fourth-floor terrace turned out to be just the thing. A large crowd of readers turned out to meet this talented young writer, and everyone told us later how charmed they were by Miss Winthrop. The author returns this Friday with her follow-up novel, December, another sophisticated character study that further solidifies her reputation as a major up-and-coming talent. The Carters live a seemingly charmed life with successful jobs, a home in New York City and a weekend getaway in the country. All is well until their 11-year-old daughter Isabelle stops talking, leading to a year of psychiatrist visits, family introspection, resentment and confusion. Was it trauma-induced? No one thinks so, which invites a more troubling thought — that it could be self-inflicted and therefore a response to her family life and an affliction shared by all. The Carters' perfect life slowly unravels as Isabelle's mother quits her job as an attorney to be with her daughter, who is on thin ice at her private school. We watch each family member cope with this mysterious crisis in this novel, which is all the more powerful for its quietness and its unique insights into the mind of a young girl who is both naive and incredibly observant. This is a wonderfully written and thought-provoking exploration of family life that ultimately leaves us with the question, How well do we know the ones we love? We contacted Winthrop in Savannah, Georgia, where she lives with her new artist husband. She answered a few questions about the book and her sense of place. Turnrow Book Co.: Isabelle is such a strong central character. How did she appear to you when you began this book? How did you most identify with her? Elizabeth Winthrop: When I started writing, Isabelle was a blank slate to me. What I was interested in was the effect her silence had on her parents, and so at first I wrote only from Ruth and Wilson's points of view, examining their different takes on and reactions to Isabelle's silence. Writing around Isabelle became increasingly difficult, because despite her silence and the fact that I hadn't tackled her point of view, she was such a central character. When finally I understood that it would be essential to write from her point of view, it was actually much easier than I thought it would be because I found I had already imagined her into being through the eyes of her parents; I had learned who she was through them. Giving her a voice of her own, so to speak, was actually quite fun; it was an incredibly interesting exercise to return to the lens of childhood and see the world again in the way I did as a child. TBC: New York was so wonderfully described and realized through Isabelle's eyes, it was like another character in the novel. What role has the city played in your life and how has it colored your view of the world? Winthrop: Growing up in New York was an amazing experience, although I think I appreciate it now more than I did at the time, when I took the city and all it offered for granted. My parents still live there, so I have a home base to return to and get back there not infrequently; if I didn't, I think I'd feel like a large part of my life was somehow missing. For better or worse, it is my point of comparison whenever I visit other cities. I don't know that I'd ever actually want to live in Manhattan again, but I thoroughly enjoyed "living" there with my characters while I was in the process of writing December. TBC: Last time we met, you'd just moved from New England to Savannah, Georgia, and seemed quite comfortable there. It's one of those places, like New Orleans, that seems to host a very potent and concentrated form of Southern culture. What observations have you made about the regional differences? TBC: What are you doing in Savnnah to keep busy? Writing full time? Winthrop: I write full time in Savannah. I do work with other writers one-on-one, reading their manuscripts, and for a time I ran a writing workshop. Now, I spend most of my time writing, both creatively on my next project, and doing various freelance articles. 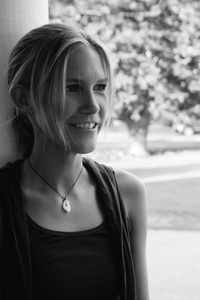 Winthrop: Maile Meloy's Half in Love, again. Her stories seem so quiet and perfect to me. Roxana Robinson's Cost. I wasn't sure at times as I read this book, but the ending drove me to tears, and that's pretty amazing, in my opinion. Jhumpa Lahiri's Unaccustomed Earth. She's also a master. And Tim Winton's Cloudstreet. He is one of my favorite writers in the world, and Australia, where he's from and writes about, one of my favorite places. Come by and meet the author Friday, September 19, upstairs at Turnrow, beginning at 5:30 p.m. Pre-order a signed copy of the book here.